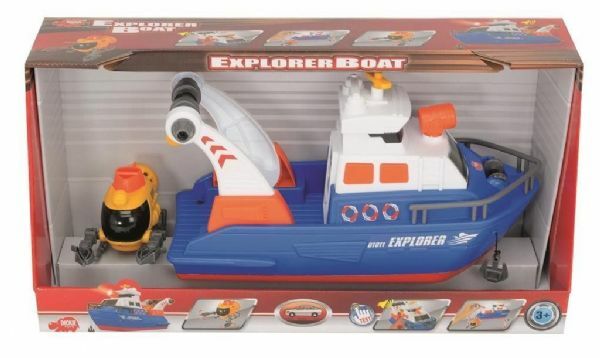 Send your child off on a voyage of discovery in the living room or playroom with the Dickie Toys Large Action Explorer Boat. The toy boat has a manual winch for lowering the submarine into the depths, where it can explore imaginary wrecks with its gripper arms. And of course it's got a proper anchor. 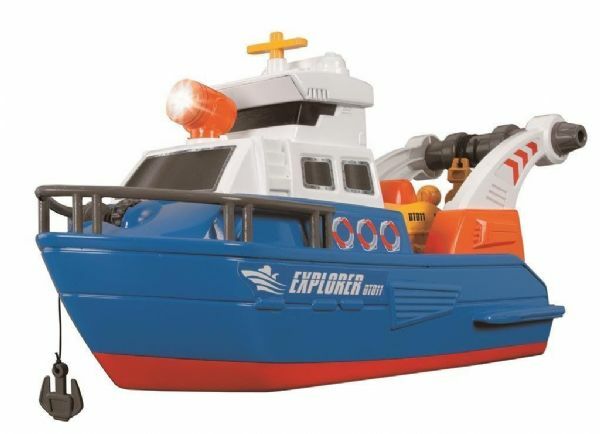 Fabulous light and sound effects give your child the feeling of venturing bravely across the vast oceans. (Even if this ocean is really just a carpet). Whether on water or land, your child will enjoy hours of fun. 3 Sound effects - seagulls, sea shore / waves and horn. Working up and down function anchor. Winch pully - with wind up and down arm. (Winch attaches to mini submarine). Mini submarine has claw effect garb arms.